The Conjuring is probably the only movie that made me jump before I ever even saw it. The creepy trailer had me intrigued right away. Yes, the film is another haunted house thriller, but it looked pretty good. 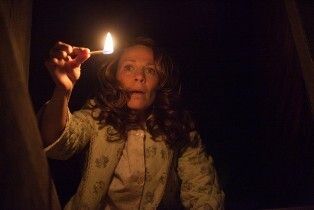 Did The Conjuring deliver when I saw the 112-minute feature on the big screen? For the most part I have to say yes. The film is full of the things that scared us the most as children, still lingering in our minds into adulthood. We know there are no monsters hiding under our beds or in our closets, but what if there were? At its best, This movie plays upon those old fears with chilling tension. Where the film doesn’t quite work is in its lack of focus. The Conjuring can’t decide who its main characters are, or what kind of ghost story it wants to be. It also unnecessarily asks us to believe this all really happened, instead of letting us get lost in the “things that go bump in the night” fun. The film is based on the “true” accounts by real-life “paranormal activity investigators” Ed and Lorraine Warren, as well as the also non-fictional Perron family. 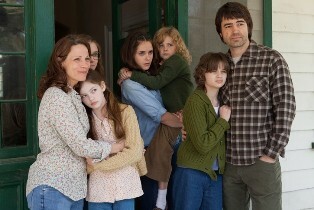 Set in 1971, Carolyn and Roger Perron (Lili Taylor, Ron Livingston) move into an old Rhode Island farm house with their five young daughters. The Perrons were looking for some quiet country living on their large rural property, but little do they know their new house still has some occupants. It turns out the house has a history dating back to the time of 17th century witch trials. There are now some restless spirits and demons on the loose. If there is anything we have learned from ghost stories, it’s that evil spirits love little children. Things are amiss from the very moment the family steps into the new house. The first clue being that the family dog won’t go inside the house. We also know that as much as spirits love children, they hate dogs. Dogs and children have a subliminal perception that rational adults don’t have; they know when something’s not quite right. 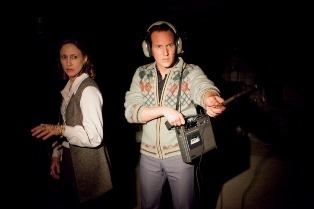 Things go very wrong very quickly in The Conjuring. After a few bumps in the night, things escalate to downright terrifying proportions. In one of the best (and scariest) scenes in the film, the ghosts decide to join in on a game of hide-and-clap. If you’re not familiar with hide-and-clap (as I wasn’t) it is like hide-and-seek, except the seeker is blindfolded and they ask the hiders to clap as a clue to their location. Why anyone would allow their children to walk around blindfolded in a creaky old house with a huge, hardwood staircase is beyond me, but it certainly adds tension to story. Before long, the desperate family engages the help of Ed and Lorraine Warren (Patrick Wilson, Vera Farmiga) to help rid the house of its ghosts. The Warrens quickly determine that not only is the house haunted, it contains a nasty demon intent on killing the family. The house itself needs an exorcism. While most people would be either horrified or in total disbelief, the Perrons accept this without question, even though they aren’t even religious. This is where the film loses a little focus for me. Is it a ghost story or a possession story? It tries to be both, which doesn’t quite work. Unlike a film like The Exorcist, which is full of religious imagery and themes, The Conjuring spends most of its time with typical ghost story scares – mysterious bumps, things moving around, etc. By the time the scripture and holy water come out, it just doesn’t make a lot of sense here. The other problem with the film is that it can’t decide if it wants to be about the Perrons or the Warrens. A side story with the Warrens and their own young daughter feels tacked on and unnecessary, though it does contain one of the most skin-crawlingly scary dolls I’ve ever seen. Despite those caveats, I still found The Conjuring to be a fun movie. The early scenes, with the family discovering all that is wrong with their new house, are truly thrilling. The film is well crafted and the acting is believable for the most part (if a little understated). I liked the 1971 setting with its lack of modern technology, making the family’s situation all the more isolated and desperate. As a horror film that is meant to make you jump, this one works well enough. I love a good spooky movie. I can’t wait foe this to come out on DVD, so I’m going to see it in the theater.